The only change I would have to make would be to change the word "home" to "love". I was so in "love" with this idea because my friend is getting married at a beautiful Wine Vineyard in California. One thing lovely about wine bottles is that they come in all shapes and sizes. We started to ask around and recruit people to save their wine bottles after they have "used" them. Luckily, a heavy blizzard hit us and we were able to collect a lot of wine bottles from family and friends! We had to go through the different shaped bottles and pick our winning 4 bottles. 3. Remove all wine bottle labels. Some of the wine bottle labels peeled off so easily while others were more stubborn. Check out my How to: Remove Sticky Labels post to learn an easy removal solution! 4. Mark the bottom of the wine bottles. Use a metallic sharpie to remind yourself which bottle will go to each letter. 5. Paint the bottles with chalk paint. 6. Hot Glue the twine around the bottles. Tip: If you are wrapping the more curvy parts of the wine bottle, be sure to add more hot glue dots to prevent the twine from slipping out of its shape. Tip: Alternate where you place the twine on each bottle. See example below. Match the letters to the corresponding bottles that you have labeled on the bottom. 8. Hot Glue the letters. Glue the letters to the sides of the wine bottles. 9. Display and admire the finished product! Don't forget to place the corks back into the tops! Wa-la! 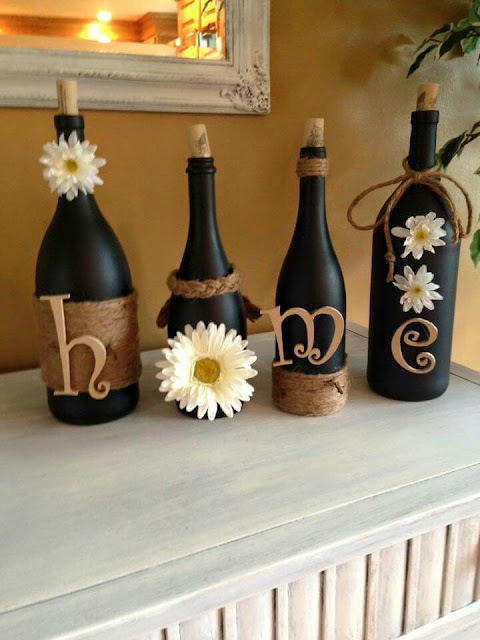 Now you have your very own wine bottle decor ready for display! I love repurposing things! Please share if you have any DIY repurpose projects!